Monasticism is one of the most fundamental institutions of Buddhism. Monks and nuns are responsible for preserving and spreading Buddhist teachings, as well as educating and guiding Buddhist lay followers. Collectively, the ordained male and female Buddhist monastics constitute the Buddhist sangha. avāsā: a temporary house for monastics called a vihara. Generally more than one monk stayed in each house with each monk in his own cell, called a parivena. ārāma: a more permanent and more comfortable arrangement than the avasa. This property was generally donated and maintained by a wealthy citizen. This was more lavish (as suggested by the name – Araama means both pleasant and park). It generally consisted of residences within orchards or parks. One of the more famous Arama is Anathapindika's, known as Anathapindikassa arame, built on Prince Jeta's grove. It had buildings worth 1.8 million gold pieces built in a beautiful grove, with the total gift worth 5.4 million gold pieces. After the parinirvana of the Buddha, the Buddhist monastic order developed into a primarily cenobitic movement. The practice of living communally during the rainy vassa season, prescribed by the Buddha, gradually grew to encompass a settled monastic life centered on life in a community of practitioners. Most of the modern disciplinary rules followed by monks and nuns—the Patimokkha—relate to such an existing, prescribing in great detail proper methods for living and relating in a community of monks or nuns. The number of rules observed varies with the order; Theravada monks follow around 227 rules. There are a larger number of rules specified for bhikkhunis. Monastic institutions and missions became vehicles for the spread of literacy and culture throughout the ancient world and held an important place in promoting charitable causes, building libraries, hospitals, schools, and universities. We see this in the Mauryan, where Emperor Ashoka builds rest houses for weary travelers, free hospitals for both people and animals, and wells and helped monasteries become institutions of learning such as Nalanda University and Vikramshila . During the Tang Dynasty the monasteries fostered artistic creativity, cared for the sick, old, and orphaned, and ran community development projects such as developing roads and building bridges and wells. Even today, in Southeast Asia, many monasteries serve as free accommodations, retirement homes, and homes for the homeless or chronically ill. Poor families frequently use monasteries as hostels. They serve as village libraries and centers of news and information, and the surplus money is used to make schools. The Buddhist monastic order is theoretically divided into two assemblies, the male bhikkhu (Pali, Skt. bhikshu) assembly, and the female bhikkhuni (Skt. bhikshuni) assembly. Initially consisting only of men, the Buddha recognized women after his stepmother, Mahaprajapati, asked for and received permission to live as an ordained practitioner. Female monastic communities in the bhikkhuni linneage were never established in the Vajrayana communities of Tibet and Nepal; Theravada communities formerly existed, but died out between the 11th and 14th century. Ordination in the bhikkhuni linneage continues to exist among East Asian communities, and attempts have been made at a revival in Southeast Asia and Sri Lanka . Monks and nuns are expected to fulfill a variety of roles in the Buddhist community. First and foremost, they are expected to preserve the doctrine and discipline now known as Buddhism. They are also expected to provide a living example for the laity, and to serve as a "field of merit" for lay followers, providing laymen and women with the opportunity to earn merit by giving gifts and support to the monks. In return for the support of the laity, monks and nuns are expected to live an austere life focused on the study of Buddhist doctrine, the practice of meditation, and the observance of good moral character. The relative degree of emphasis on meditation or study has often been debated in the Buddhist community. A Bhikkhu or Bhikkhuni first ordains as a Samanera (novice) for a year or more. Male novices often ordain at a very young age, but generally no younger than 8. Women usually choose to ordain as adults, since there is no expectation that they do so in childhood. Samaneras live according to the Ten Precepts, but are not responsible for living by the full set of monastic rules, vinaya. Higher ordination, conferring the status of a full Bhikkhu or Bhikkhuni, is usually given only to those 20 or older. Women monastics follow a similar progression, but are required to live as Samaneras for a longer period of time, typically five years. In Thailand, monks are considered well supported by the community, and in return the monks offer guidance in life and in the Dharma. The disciplinary regulations for monks and nuns are intended to create a life that is simple and focused, rather than one of deprivation or severe asceticism. Celibacy is of primary importance in monastic discipline, seen as being the preeminent factor in separating the life of a monastic from that of a householder. Depending on the tradition and the strictness of observation, monastics may eat only one meal a day, provided either by direct donations of food from lay supporters, or from a monastery kitchen that is stocked (and possibly staffed) by lay supporters. Unlike Christian monastics, Buddhist monastics are not required to live a life of obedience to a superior. However, it is expected that monastics will offer respect to senior members of the Sangha (in Thai tradition, seniority is based on the number of rains retreats, vassas, that one has been ordained). The Buddha did not appoint a successor, nor did he specify rules mandating obedience in the monastic code. Individual groups of monastics are expected to make decisions collectively through regular gatherings of the community, at which decisions regarding violations of monastic rules and the dispositions of communal property are to be made. Individual relationships of teacher/student, senior/junior, and preceptor/trainee may be observed among groups of monastics, but there are no formal positions, nor is there any authority to give orders or commands invested in senior monks. An abbess or abbot, typically a senior monastic still young enough to be active, is usually responsible for the day-to-day administration of the monastery, and may appoint others to assist with the work. In some traditions, the abbess/abbot is chosen by a vote of the monastics in a monastery. In other traditions (Thailand , for example), the abbot is chosen by the lay community. Monastic practices vary significantly according to location. In part, this can be attributed to differences in the scriptural and doctrinal traditions that were received in different parts of the Buddhist world. Additionally, local concessions to social, geographical, and climatic conditions have been adopted by most monastic orders in order to smooth the integration of monks into local communities, and to ensure that monks live in a safe and reasonable manner. In cold climates, for instance, monks are permitted to own and wear additional clothing not specified in the scriptures. In areas where begging rounds are impossible (due to traffic, geography, or disfavor by the lay community), monks more commonly employ a kitchen staff of monks or lay followers who are responsible for providing meals for the community. In Tibet, before the Communist invasion in the late 1940s and early '50s, more than half of the country's male population was ordained. Due to the oppression, and destruction of monasteries and libraries by the Chinese, this is no longer the case—the Chinese have historically justified this by the accusation that the Tibetan monks exploited the poor peasantry of Tibet for their sustenance. Hoping to find religious freedom, many Tibetan monks annually risk crossing the Himalayas , often trying to reach India . While generally adhering to a Mahayana tradition that advocates the virtues of vegetarianism, Tibetan monks generally eat meat as a concession to climatic conditions that make a plant-based diet largely unfeasible. In East Asia, monastics live in greater isolation from the lay population than is observed in most Theravada countries. Because of local conditions of geography and climate, as well as local attitudes towards begging, monks generally do not make begging rounds in China , Korea , Vietnam and many parts of Japan . Instead, monasteries receive donations of bulk food (such as rice) and funds for the purchase of food that is then stored and prepared at the monastery. The management of the kitchen and monastery properties may be the purview of a specially designated layman, or a monk who has been given a special role by the abbot of the monastery. 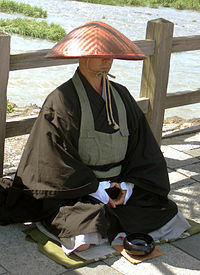 Monastics in Japan are particularly exceptional in the Buddhist tradition because they generally marry after receiving their higher ordination. There had long been many instances of Japanese monks marrying, from the Heian period (794-1185) onward,  but it was not predominante until a government initiative was passed during the Meiji Restoration that required monks to seek wives. While one of the four Tibetan monastic orders permits marriage, as well as some Korean orders, Japan is the only Buddhist country where the majority of religious specialists are married. In Thailand , Cambodia , Laos , and Myanmar , where the Theravada school is dominant, there is a long tradition of temporary ordination. During a school break, many young men usually ordain for a week or two to earn merit for loved ones and to gain knowledge of Buddhist teachings. In most countries, this temporary ordination occurs during the vassa retreat, which is regarded as a period of intensified spiritual effort by local Buddhists. Men in Thailand typically ordain only before being married; men in Laos and Myanmar could traditionally return to the monastery from time to time after being married, provided that they secured their wives' permission. Theravada monks are also most likely to engage in traditional practices of collecting alms, although the urbanization of parts of Southeast Asian (particularly Thailand) has presented a challenge to this practice. In Thailand, where the Buddhist institution has traditionally been closely associated with the government and the institution of kingship, a more hierarchical structure has evolved to deal with the administration and regulation of monasteries. This system initially stemmed from a system of royal patronage, in which monks who were appointed the abbots of 'royal monasteries' (those endowed and supported by members of the royal family) were accorded greater respect than those who headed more conventional monasteries. This system remained fairly unstructured until the modernisation efforts of the 19th Century, during which a more formal system of governance was created by the central government. Modern Thai monks are ranked according to their ability to pass examinations in Buddhist doctrine and the Pali language, and are appointed to successively higher positions in the ecclesiastic hierarchy on the basis of these exams, as well as their support among influential members of the royal family and government. Local affairs continue to be handled primarily by the local monastic and lay community, but nationwide efforts (such as curriculum decisions for monastic schools, and the authoritative form of scriptures and rituals) are typically made by the central hierarchy.